Motor rotation is transferred to the legs via crank plates and linkage rods, causing the rear legs kick the robot forward in a hopping motion. As more of the weight is supported by the front legs, rollers attached to the feet eliminate the friction that would result from this extra load. 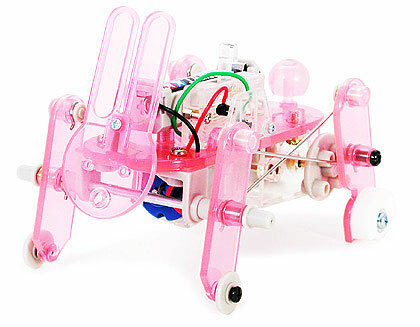 The Mechanical Rabbit’s body is made from a transparent pink ABS resin that allows you to see all of the motors, gears, cranks, and linkage rods in action. Battery moved forward for effective movement. The Mechanical Rabbit is powered by a single AAA (a.k.a. R03 or UM4) battery (sold separately) to keep its total weight low. The motor and battery case have been shifted to the front of the body to allow for smooth, unhindered rear leg movement. The Mechanical Rabbit comes with guides that can be attached to both sides of the rabbit to make it compatible with Mini 4WD circuits. You can race your friends! Includes guides that can be attached on both sides to make the mechanical rabbit usable on Mini 4WD circuits. Continuous running time with Alkaline battery: 40 min.